Hotel Hibiscus Garden is located on Playa Lagartero, about 10 km from Santa Catalina. We offer a private shuttle service to and from Santa Catalina for all of our hotel guests. 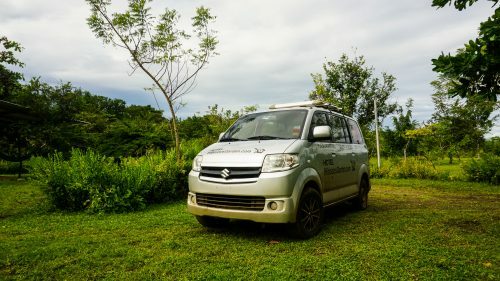 Whether you have a trip to Coiba Island planned, a surf lesson, dinner or just a day at the beach, our shuttle service is available to you! Simply let us know your plans and we will shuttle you to and from Santa Catalina for $10 for one person or $5 per person for multiple passengers. Rent a car, take a taxi or ride the bus! 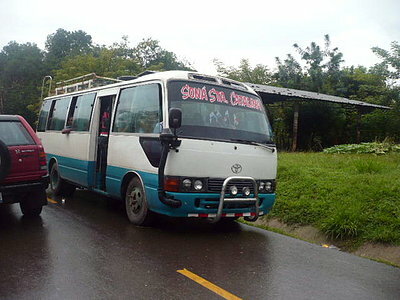 The bus is the most economical option to get to Hotel Hibiscus Garden. From Albrook Bus Terminal, take the bus to Soná where you will take another bus to Santa Catalina. It takes about 6 hours to arrive from Panama City by bus or 4.5 hours by car. We are located 10 km before Santa Catalina. Let the bus driver in Soná know that you are going to Hibiscus Garden and they will let you off at our driveway. Our driveway is 1 km long, so please let us know when you will arrive and we will pick you up!